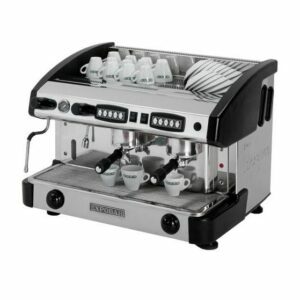 The Monroc 2 Group is a commercial espresso machine which offers excellent results without a prohibitive price tag. Created by Expobar – an experienced brand that has a great reputation within the industry – it is absolutely ideal for independent cafes, sandwich shops or small restaurants that want to offer their customers a really high-quality brew. 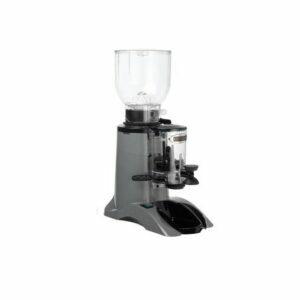 Espresso coffee makers like the Monroc are great for modern businesses because they offer the convenience and speed which customers now expect, alongside the great standard that you want to bring to your clientele. 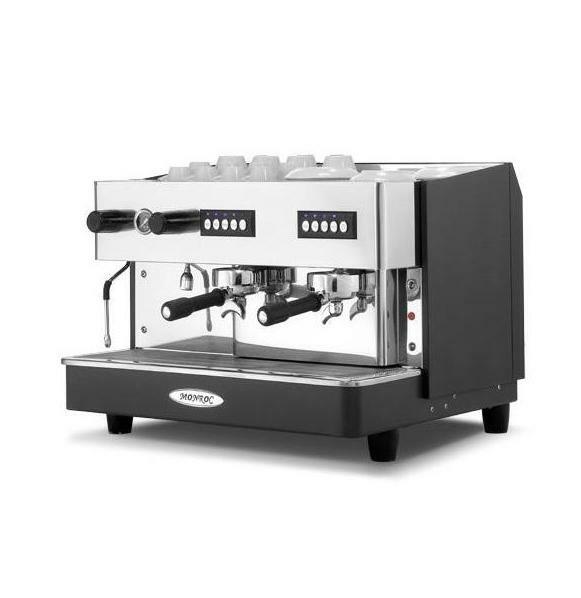 The Monroc 2 group semi-automatic espresso machine is also great for staff, allowing them to produce a range of popular hot beverages, including lattes and cappuccinos, with relative ease… and minimal clean up! 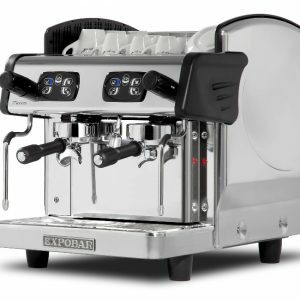 It’s no surprise, then, that we’re seeing such a surge in these barista machines that make life so much easier for the cafes that choose to invest in them. Best of all, a long term investment isn’t even essential, since you can also choose to lease our Monroc machine while you work out whether it’s right for you. And this is without getting into the technical specs! All of this means that, with the Monroc 2 Group coffee machine, you are getting a surprisingly robust and efficient little gadget that packs a whole lot of functionality into a convenient size. The use of an electronic switchboard to help you control dosages is particularly convenient, as you can easily program the right number of drinks (up to two simultaneously) to dispense at the correct volume. Great tasting coffee and a great sense of style: these are the things that every café needs if they’re to be a success. The Monroc 2 Group offers both in abundance, with a slick silver and grey exterior that will slide seamlessly into any space. Whether you’ve embraced the contemporary trend for industrial design, used a retro theme or just kept things classic, this coffee espresso machine will add an extra dash of style. With some nifty storage space on top, you’ll also be able to use it as easy shelf space for your cups and utensils. It’s not just the style that makes the Monroc so versatile, though, but also the range of needs that it can be adapted for. In a busy coffee house, it will hold under the pressure, especially if you have a number of machines, and in a smaller restaurant or café, it can easily keep your customers topped up with high-quality caffeine. 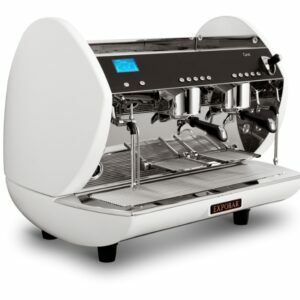 You can also use this espresso style barista machine to make drinks to-go; great for the fast-paced takeaway. Of course, there are plenty of other options for different types of businesses, including self-serve floor standing vending machines and bean to cupmachines. 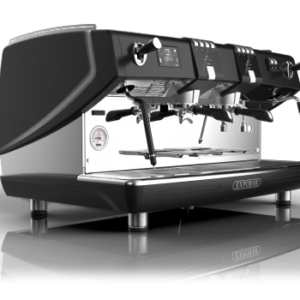 The Monroc is just one of the many different barista machines that are available here at Forward Vendors, with larger models that are perfect for busier locations and franchises as well as different styles to choose from. We think that it’s important to spread great coffee across the country, and help businesses create that experience for their clients – so if you think that you might be interested then we’d love to hear from you! Call 0800 444 443, tell our team what your needs or objectives are and we’ll be able to explain the different options available.